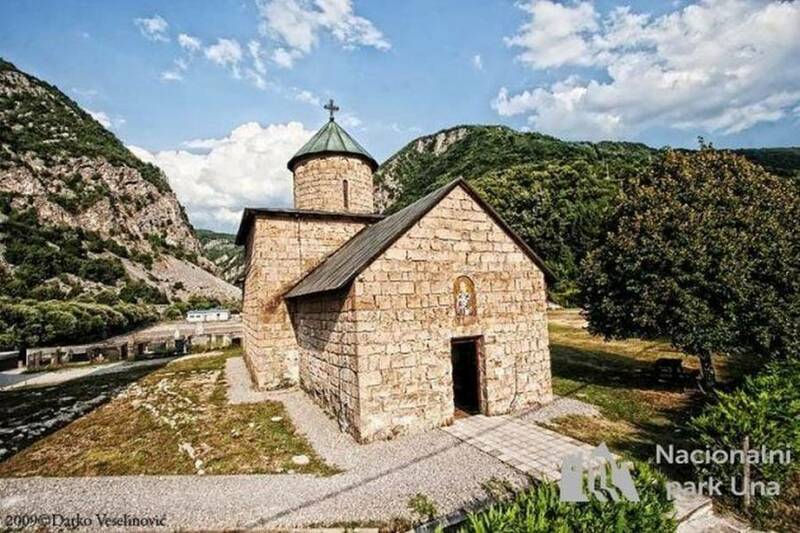 The Rmanj monastery in Martin Brod, situated in a picturesque setting where the river Unac meets the river Una is an important spiritual centre of the Northern tri-border area (Bosnia – Lika – Damatia). It is believed that the monastery was founded by Katarina Branković (1418/19 – 1492) who was a daughter of a Serbian despot Đurađ Branković, and was married to count Ulrich II of Celje. In earlier documents, the monastery Rmanj is called: Hrmanj, Ajerman, Chermlja, Szermil, Hermanya, Herman, and it was named after the son of Katarina, Herman III, who died young due to illness so Katarina built the monastery in his honor. However, first reliable source point towards the year of 1498, when a valuable Icon of the Mother of God was given as a tribute to the monastery by “Petar, Petrašin and Vukdrag”.  From the engravings on a stamp (from 1553) we can conclude that the Rmanj monastery had existed before the restoration of Serb Orthodox Patriarchate of Peć in 1557. 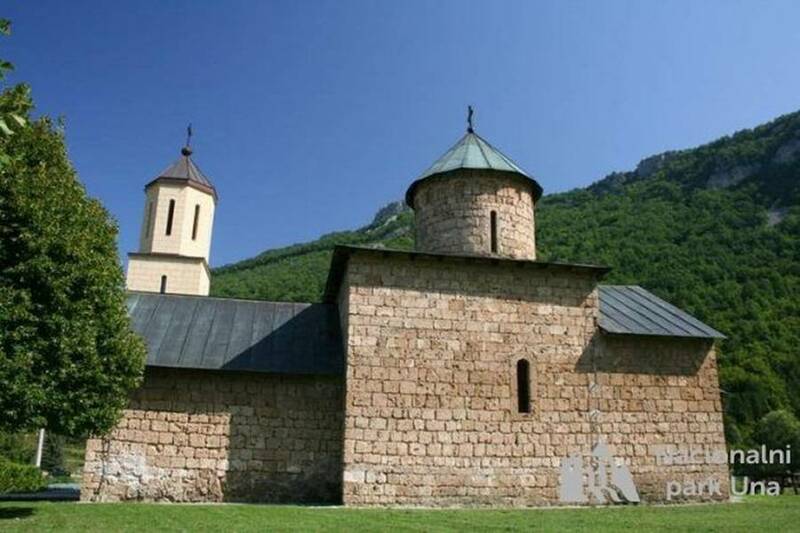 After the aforementioned restoration and with a transfer of the see of the Dabar-Bosnia metropolitanate bishop to Rmanj, the monastery increasingly became an important administrative centre too. The most prominent bishop of that time was surely Bishop Teodor, who founded an Orthodox Christian Seminary in Dalmatian monastery of Krka in 1615. 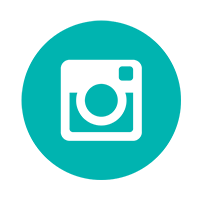 The Bishops of Rmanj were titled Bishops of Dabar-Bosnia, Klis and Lika. At the end of 16th and beginning of 17th century there were up to 100 monks in the Monastery. In the first half of the 17th century the monastery was an important centre of icon painting and transcription, and a fertile ground for new spiritual and national elite. At the beginning of the 19th century the monastery was deserted, without any monks living in it. 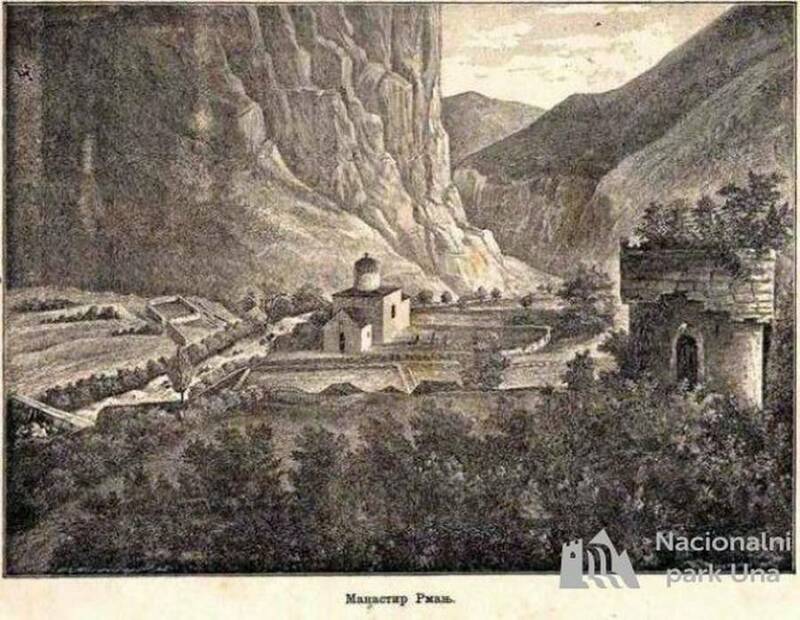 The abandoned monastery was reconstructed and revived by a willingness and financial support of a tradesman from Bosansko Grahovo, Gavro Vučković in 1863. In 1875 the monastery is once again devastated and its inhabitants tortured. At that time a famous English archaeologist John Arthur Evans visited Rmanj and in his Illyrian letters he described Serb leaders and commanders, and their gathering around the monastery temple. With the fall of the Kingdom of Yugoslavia came the most serious devastation of the monastery in its tumultuous history. During the World War II the monastery was used as a partisan hospital and as such was bombarded and levelled to the ground by a Nazi German Luftwaffe. Famous but never thoroughly described and studied frescos and icons of the monastery were destroyed never to be restored again. 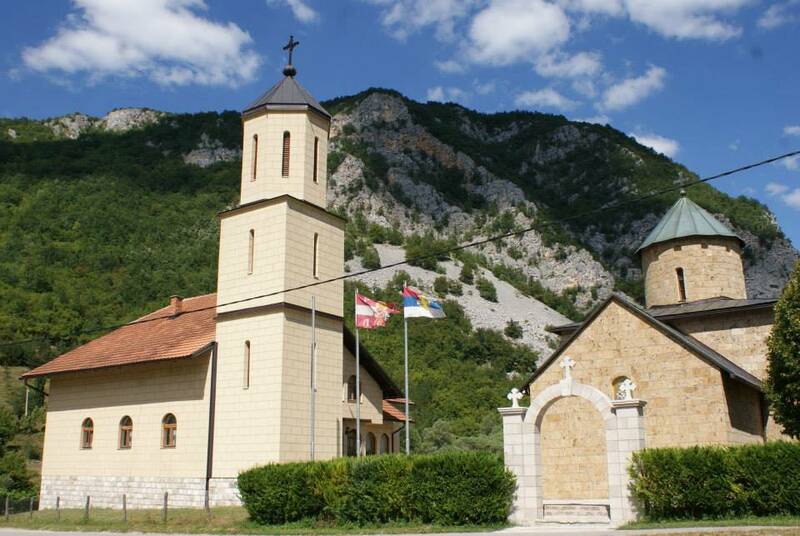 For over thirty years, the authorities of Socialistic Yugoslavia denied the resurrection of the Rmanj monastery. However, the persistence and effort of the Bishop of Dalmatia Stefan (Boca) finally led to the restoration of the monastery temple in 1974. In 1991 Bihać-Petrovac eparchy Bishop Hristozom started a full scale renovation and reconstruction of the monastery with reintroduction of monks living and working there. 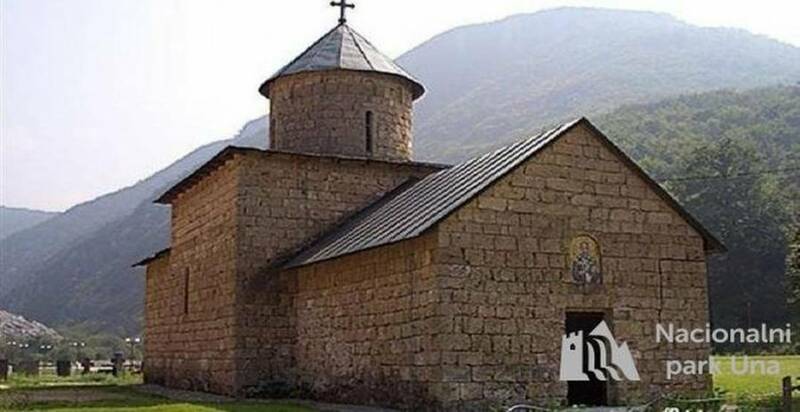 After the recent war the brotherhood of the Rmanj monastery returned to Martin Brod and finally finished the reconstruction of the monastery. In 2006 a new monastery housing block was consecrated. The building was erected due to effort and determination of archimandrite priest Sefarim (Kužič) and igumen priest Sergije (Karanović).